(Nanowerk News) Lithium ion batteries (LIBs) are a huge technological advancement from lead acid batteries which have existed since the late 1850’s. Thanks to their low weight, high energy density and slower loss of charge when not in use, LIBs have become the preferred choice for consumer electronics. Lithium-ion cells with cobalt cathodes hold twice the energy of a nickel-based battery and four-times that of lead acid. Despite being a superior consumer battery, LIBs still have some drawbacks. Current manufacturing technology is reaching the theoretical energy density limit for LIBs and overheating leading to thermal runaway i.e. “venting with flame” is a serious concern. South Korean researchers at the Center for Self-assembly and Complexity, Institute for Basic Science (IBS), Department of Chemistry and Division of Advanced Materials Science at Pohang University, have created a new LIB made from a porous solid which greatly improves its performance as well as reducing the risks due to overheating ("Solid lithium electrolytes based on an organic molecular porous solid"). Simple incorporation of various lithium precursor to porous CB exhibits high lithium ion conductivities, mobility and safer dried solid lithium electrolytes. Since 2002 there have been over 40 recalls in the US alone due to fire or explosion risk from LIBs used in consumer electronic devices. These types of batteries, in all of their different lithium-anode combinations, continue to be an essential part of modern consumer electronics despite their poor track record at high temperatures. The Korean team tried a totally new approach in making the batteries. According to Dr. Kimoon Kim at IBS, “we have already investigated high and highly anisotropic [directionally dependent] proton conducting behaviors in porous CB for fuel cell electrolytes. 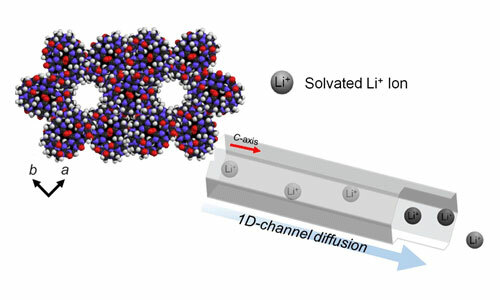 It is possible for this lithium ion conduction following porous CB to be safer than existing solid lithium electrolyte -based organic-molecular porous-materials utilizing the simple soaking method.” Current LIB technology relies on intercalated lithium which functions well, but due to ever increasing demands from electronic devices to be lighter and more powerful, investigation of novel electrolytes is necessary in order. The new battery is built from pumpkin-shaped molecules called cucurbituril (CB) which are organized in a honeycomb-like structure. The molecules have an incredibly thin 1D-channel, only averaging 7.5 Å [a single lithium ion is 0.76 Å, or .76 x 10-10 m] that runs through them. The physical structure of the porous CB enables the lithium ions to battery to diffuse more freely than in conventional LIBs and exist without the separators found in other batteries. In tests, the porous CB solid electrolytes showed impressive lithium ion conductivity. To compare this to existing battery electrolytes, the team used a measurement of the lithium transference number (tLi+) which was recorded at 0.7-0.8 compared to 0.2-0.5 of existing electrolytes. They also subjected the batteries to extreme temperatures of up to 373 K (99.85° C), well above the 80° C typical upper temperature window for exiting LIBs. In the tests, the batteries were cycled at temperatures between 298 K and 373 K ( 24.85° C and 99.85° C) for a duration of four days and after each cycle the results showed no thermal runaway and hardly any change in conductivity. Various conventional liquid electrolytes can incorporate in a porous CB framework and converted to safer solid lithium electrolytes. Additionally, electrolyte usage is not limited to use only in LIBs, but a lithium air battery potentially feasible. What makes this new technique most exciting is that it is a new method of preparing a solid lithium electrolyte which starts as a liquid but no post-synthetic modification or chemical treatment is needed.